Looking "where to sell my Mercedes Benz 250SL?" Ask the Chicago Car Club! Are you wondering "where to sell my Mercedes Benz 250SL ?" The Chicago Car Club is interested in classic cars of all makes and models, especially a Mercedes Benz 250SL. We make the process of selling your Mercedes Benz 250SL quick and painless. In just a matter of hours we will have your classic valued and, if you do so choose, turned into money in your pocket. All it takes is a phone call or electronic inquiry to get the ball rolling. Mercedes-Benz has been known for producing some of the highest-performing, elegant, luxury cars in the industry. Initially, the German car manufacturer was known for producing sturdy, comfortable luxury cars. Throughout the 50’s and 60’s though Mercedes-Benz introduced some amazingly designed and powerfully engineered sports cars that gained the company worldwide acclaim for it’s high-performance models. One of these powerful and eye-catching machines is the 250 SL. 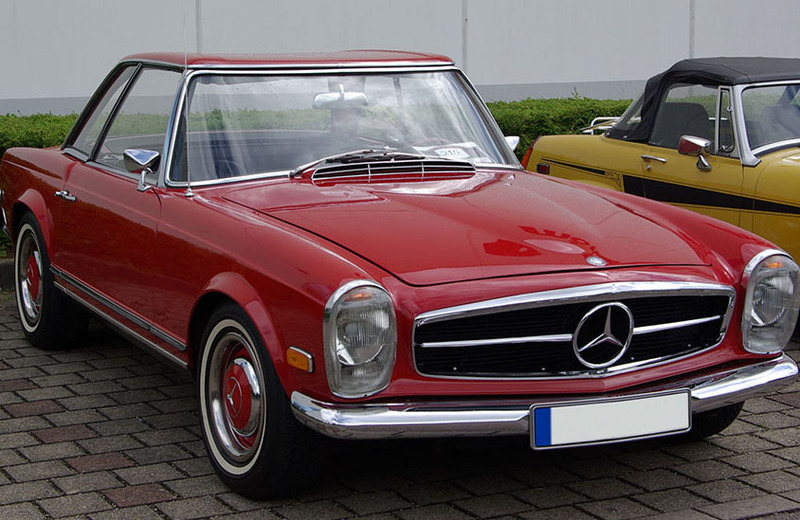 The 250 SL was first introduced at the 1967 Geneva Motor Show. Production was already underway for the 250 SL in 1966, yet the entire production of this model only lasted one year. The 250 SL is, therefore, a very rare and sought after model especially amongst classic sports car collectors. The engineering of the 250 SL gave the car higher agility, a new engine, and rear disc brakes. The 250 SL was manufactured in 4-speed automatic transmission and 4 or 5-speed manual transmissions. The short lived manufacturing was efficient nonetheless, and a total of 5,196 250 SLs were made and sold. The biggest change that the 250 SL featured was the M129.II engine with much higher-performing specs and engineering. The overall maximum power did not increase from older models, but the torque did improve dramatically. One of the most notable changes was the introduction of the 2+2 California Coupe style of design on the 250 SL.The 250 SL did not have a soft top, but instead came with a removable hardtop and a rear bench was placed for passengers where the soft top would normally be stored. The introduction of the 250 SL helped solidify the Mercedes-Benz brand as a leader in high-performing, powerful sports cars. The designs were always elegant, modern, and intuitive but the models made in the 1950’s and 1960’s, like the 250 SL, made the brand stand out as a top manufacturer of exciting, high-performing machines.